A new trend in curbside vegetation is not just for looks. River friendly landscaping is sprouting up in neighborhoods across the DMV. 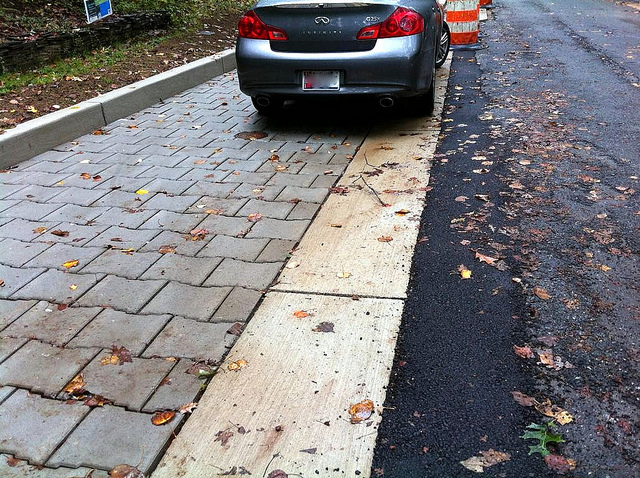 From rain gardens to permeable pavement to roadside trees, “green streets” in Montgomery County are doing more than boosting curb appeal. They’re a new and effective tool in making our local streams swimmable and fishable. Taking a cue from Mother Nature, strategically-placed trees and plants in our communities help to absorb rainwater, filter pollutants, and reduce harmful stormwater runoff — the only growing source of pollution to the Potomac River and Chesapeake Bay. So go on and give that new street tree a hug! It’s working extra hard to provide you with clean air and water. And give yourself a pat on the back while you’re at it. Thanks to you and others who are speaking up for common sense policies, nature-based solutions are gaining in popularity. In fact, our community is leading the region and the nation by embracing these and other innovative approaches to cleaning urban waters. 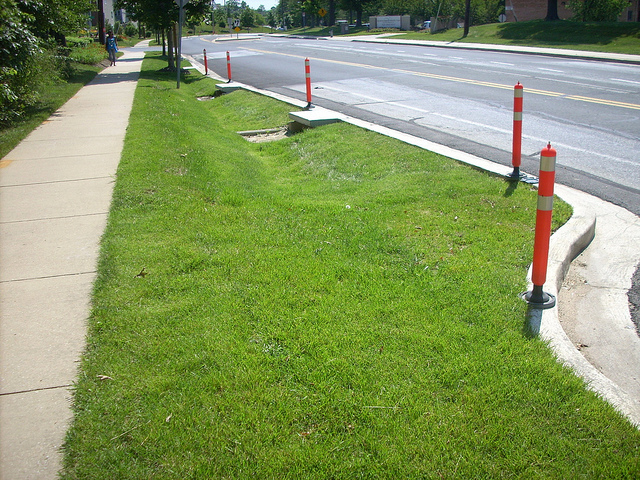 How to Tell if you're on a "Green Street"
The series of step pools reduce the flow of stormwater and allow native plantings to absorb rain and runoff naturally. Dennis Ave, Silver Spring, MD. 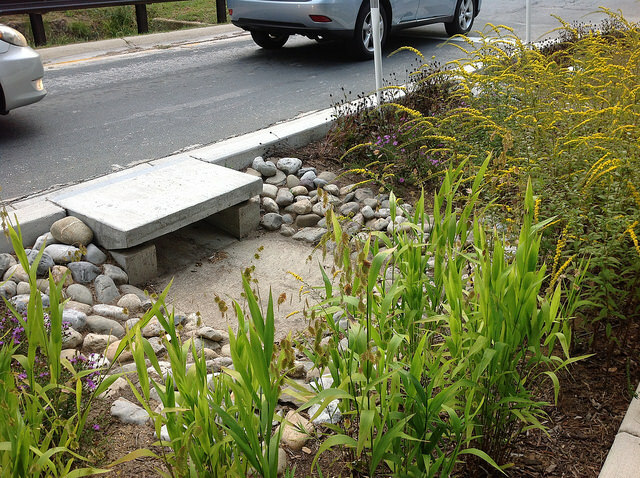 Curbside rain gardens, bioswales, permeable pavement, and tree boxes are a few of the more common types of nature-based infrastructure taking root along our roads and public right-of-ways. The new greenery helps rainwater absorb naturally into the landscape, reducing the volume of polluted runoff flowing into our streams and rivers. Nature-based solutions are the wave of the future. Communities across the country - including right here in the greater Washington, DC metro area - are building green infrastructure projects to lower costs, meet pollution reduction goals, and create in-demand walkable, sustainable neighborhoods. A strong state-federal partnership to clean up the Chesapeake Bay has led to a region-wide effort that will bring back swimmable and fishable waters to our streams and rivers. Working towards this goal, most green street programs are directed and funded at the local level, whether they're found in the District, Arlington, Hyattsville, or Wheaton. Montgomery County's Green Streets Program has been particularly effective, transforming dozens of streets over the last several years. Run by the County's Department of Environmental Protection, the program tailors each project to the specific neighborhood; projects are only constructed on county-owned land and typically take two to three years to complete. Thanks to your support for our Clean Water Advocacy program, Potomac Conservancy and allies in the region helped Montgomery County enact a strong pollution reduction plan that makes the Green Streets program and local stream restoration projects possible. We're now working directly with local champions to identify nature-based solutions in their communities. We've already heard from 5 neighborhoods who want green streets! Our friends and partners at Audubon Naturalist Society are leading a public campaign to save this critical pollution reduction program! Take action today and submit your comment in support of Green Streets! for clean water in Montgomery County! Yes, I support Green Streets!